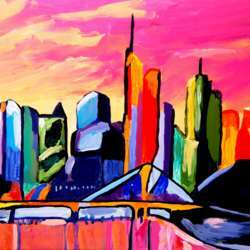 Artparty: Amazing 3 Hours Painting Session for Expats! Join us to this special art evening: 3 hours painting class with a professional Artist! You can Unleash your creativity and be inspired by colors, shapes and expressive motives. Enjoy knowledge exchange in a relaxed atmosphere. With or without prior experience: ArtParty is an art experience that is fun and gives you everything you need for your very own piece of art. You can keep your painting as a lasting memory. And who knows - beyond that, maybe impulses and ideas that will inspire you even further! Art parties take place as well in inspiring locations such as in galleries, studios, cafes or restaurants, always in a quiet, relaxed atmosphere. Be inspired by great locations in the Rhine-Main area and create your own artwork in 3 to 4 hours! All materials are provided.